Stairways are among the most dangerous elements one will encounter in our environment. Often involving a vertical drop of over eight feet, the forces a human body acquires during a stair fall are substantial. Each year, falls account for millions of trips to the emergency room, numerous deaths, and countless permanent injuries. There is good reason why the Uniform Building Code and ADA technical guidelines pay so much attention to stair design and materials. Stairways literally can kill. It has been said that the Led Zeppelin song “Stairway to Heaven” was really a protest song against the dangers of stairways the band recognized in the 1970’s. This article gives a general overview of the primary laws involved in stairway fall lawsuits, with examples of how to accurately document and effectively communicate to jurors some of the technical code violations and safety problems that commonly exist on stairways, and how to communicate the safety measures that would make the stairway safe. do what a reasonable premises owner would do under similar circumstances. Thus, if a property owner or one in control fails to reasonably inspect the premises, the burden of proving notice of a dangerous condition may shift to the defendant. To require plaintiffs to establish “proximate causation” to a greater certainty than they have in the instant case, would permit defendants to gain the advantage of the lack of proof inherent in the lifeguard-less situation which they have created. (Citations omitted.) Under these circumstances, the burden of proof on the issue of causation should be shifted to defendants to absolve themselves if they can. Stairway falls account for millions of traumatic brain injuries each year. Often, your client will have no recollection of the fall itself. Defendants may argue that the plaintiff cannot establish causation because she cannot remember why she fell and no one witnessed the fall. But this argument fails if it can be established that the reason the plaintiff lacks causation evidence is because the defendant violated safety laws, such as building codes or ADA laws, and the violation of the law contributed to the evidentiary gap. Stairway building codes are often highly technical and cumbersome to explain verbally. Using pictures and graphics to explain the principles is essential. We have found that among the most effective ways to communicate dangerous stairway conditions and safety measures that would have prevented the stairway fall is through a visual depiction of the actual stairway itself. Using an as-built company to take precise laser measurements of a stairway is a less expensive way to get precise, to-the-millimeter measurements of the stair geometry. A more expensive, but more useful way of documenting a stairway is through the use of 3D laser scanning. With laser scanning, an entire room inside a building can be scanned and rendered into a 3D model of the premises. This allows one to “fly” in and around the room to view the stairway at different angles, to “cut in” to the side of a stairway and demonstrate stair height and length (rise and run) measurements, as well as the width of a stairway, and most effectively, to “rebuild” the stairway to show how safe it would have been had the defendants complied with building codes or the basic duty of care. using-laser-scanning-create-3d-model-demonstrate-unsafe-stairway-conditions-safety-fixes/) to view how effective this was in a recent case, resulting in a substantial settlement. The following is a list of examples of common building code violations and ways to depict them using photographs after a site inspection with an as-built company taking point-to-point laser measurements, and a graphic vendor demonstrating the violations. 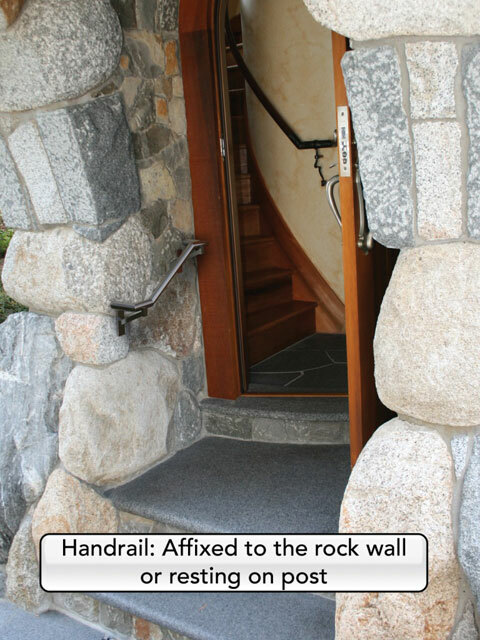 The stairway in this case was located at a Tahoe compound outside the “Guest Wing/Dormitory” building. The stairway was located under a rough-hewn stone covered bridge that leads from the main house to a round turret structure that houses an internal circular stairway up to the guest dormitory. All in all a rather innocuous-looking, Hansel and Gretel fairy tale feel. But the beauty of the construction masked a myriad of safety issues that resulted in a disabling traumatic brain injury to our 80-year-old client. Here is how we depicted the half-dozen code violations. 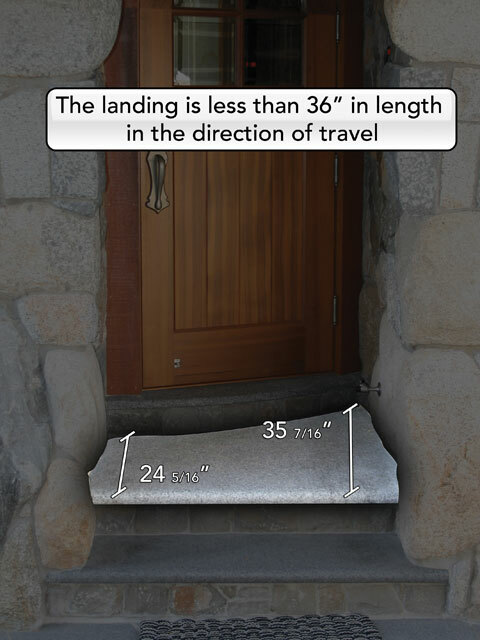 The 2001 California Building Code, section 1003.3.1.6 provides: “Floor level at doors. Regardless of the occupant load served, there shall be a floor or landing on each side of a door.” Under Exception 1.2, the section provides: “A door may open at a landing that is not more than 8 inches lower than the floor level, provided the door does not swing over the landing.” (2001 CBC Section 1003.3.1.6.) The purpose of this code section is to avoid any surprises to a person passing through the door opening. Therefore, it is necessary that there be a floor or landing on each side of doorway. It is permissible to have a step at the doorway, but for safety purposes the door must not swing out over the landing. 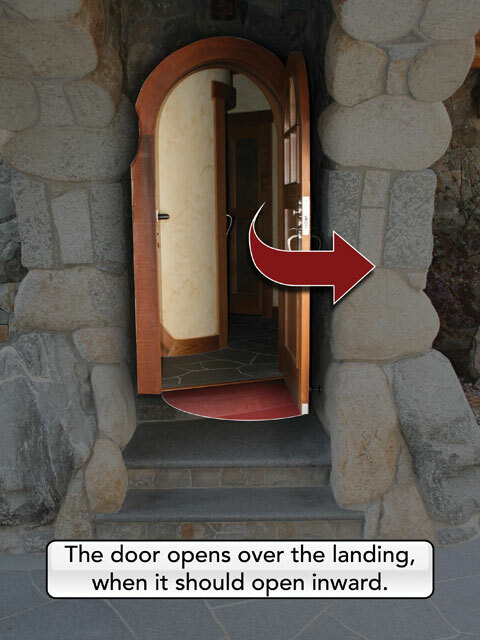 Here, the door swing forces a user outside the door backwards onto a landing that is not dimensionally safe. compliant and further contributes to the unsafe condition of the stairs. The rise of the first step measures 7 and 9/16 inches at center, and ranges from 7 & 13/16 inches at the left to 7 and 5/16 inches at the right. (See photos labeled Violation 2, 3, 5 and 6 on pages 48-50). 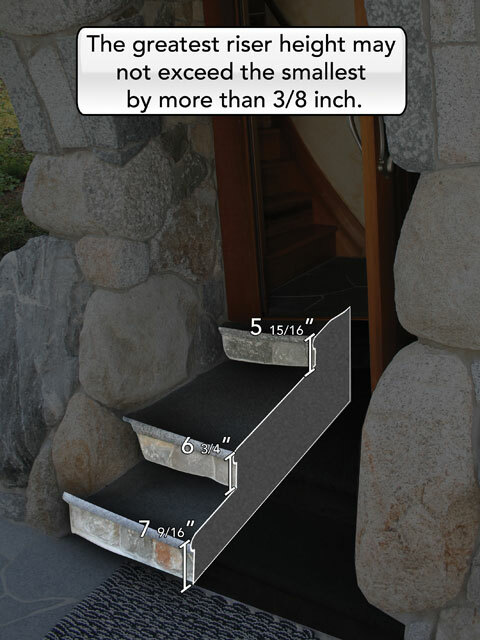 The rise of the second step is 6 ¾ inches. The rise of the third step to the threshold measures 5 and 15/16”. Thus, the stairway violates the Code because the comparative riser height of all of the steps varies far beyond the 3/8” maximum allowed: (1) the first step is nearly 1 inch higher than the second step, which is 2.5 times greater than the maximum allowed; (2) the first step is 2.5 inches greater than the third step, which is nearly 7 times greater than the maximum allowed; (3) the height of the second step is 1 and 7/16” higher than the third step, which is approximately four times greater than the maximum amount allowed by the code. These variances in riser heights – not by fractions of inches but rather by a factor of multiples of the Code maximum allowance, cause a user to encounter an unexpectedly asymmetrical stairway which throws off the user’s gait. This code violation further contributes to the unsafe condition of the stairs. Here, defendants may take the position that the second step is not a landing because it fails to meet the Code requirements for a landing. If defendants take such a position, the second step still violates this section because it is not uniform dimensionally – its concave shape is not uniform and also differs significantly from the other steps. This code violation also creates a condition not expected by users of the stairs, which they are likely to become confused by, and further contributes to the unsafe condition of the stairs. 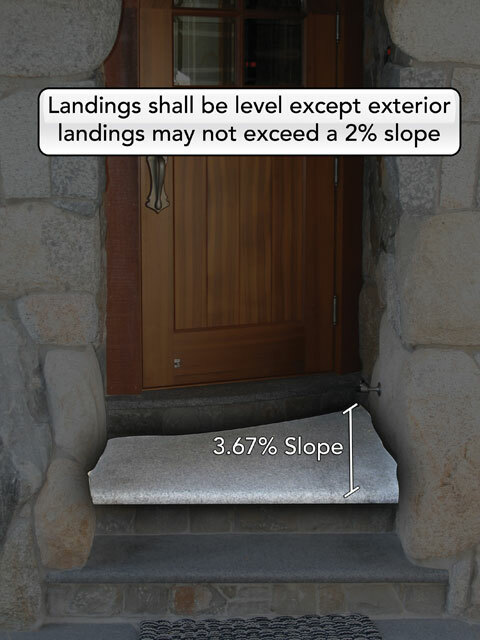 Here, the stairway landing violates the code because the landing’s slope is 3.67 percent, which is 83 percent greater than the code maximum 2 percent. As with the other violations, this code violation also creates a condition that users of the stairs do not expect, are likely to become confused by, and throws off one’s gait. As a result, this code violation further contributes to the unsafe condition of the stairs. 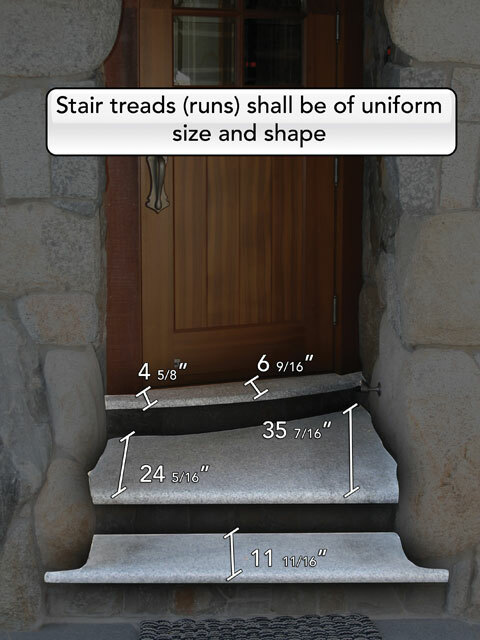 Because a step runs continuously along the stairway door, the 6-foot-8-inch headroom requirement applies at all points along the tread nosing at the threshold. 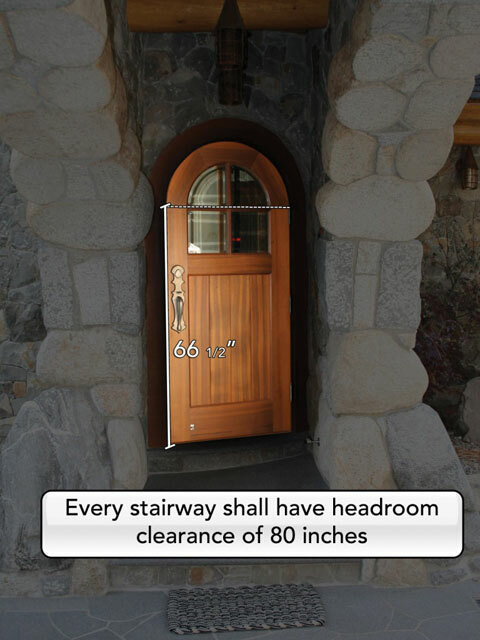 The stairway does not meet the headroom requirement, because clearance at points where the rounded door begins its tangent (i.e. from an upward plane beginning at the right and leftmost points on the tread nosing) is only 66 and ½”, more than 14” lower than the Code minimum. This violation further demonstrates a lack of attention to the building codes then in effect, and provides further evidence that defendants were negligent in their use and maintenance of the property. So you’ve got code violations, show me the causation! A primary attack by defendants in stairway cases is causation. “Who cares if you’ve got building code violations, but how would compliance have prevented the accident?” A handrail violation is the most common building code violation that is intuitively linked to causation. But what of the violations above? Notably, there was no strict code requirement at that stairway, because it only had three risers. This is where it is important to consult with a safety expert or architect. The stairway is a system, and once safety of the system is compromised by the multiple building code violations at the stairs, defendants may not rely on the absence of a strict code requirement for a handrail to avoid liability. Here, given the stairway’s condition – with its uneven and asymmetrical steps – and the many safety laws it violated, numerous safety experts agreed that the “de minimus” cost of a handrail was minimally necessary to protect guests to the property. We used the trial graphic vendor to superimpose a handrail at the property here, to demonstrate that the cheap fix would have also fit in with the overall aesthetic of the property. Stairway-fall lawsuits present unique challenges in explaining to the jury the technical building code violations and safety measures that would have prevented a fall. Make use of photographs and 3D video modeling where appropriate to effectively communicate these principals to your jury. 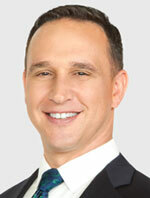 Anthony Label is the team leader of the Label Trial Team at The Veen Firm, P.C. in San Francisco. Anthony’s practice emphasizes aggressive and compassionate advocacy for catastrophically injured plaintiffs. He lives in San Francisco with his wife and children. For more information, see the Website at www.veenfirm.com. 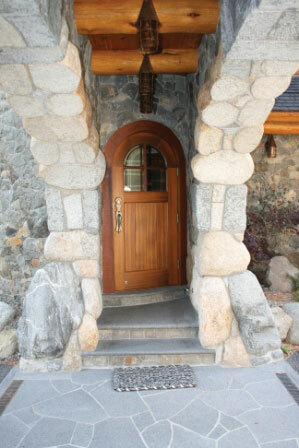 The stairway of the guesthouse at a Tahoe estate. Plaintiff expert created this digitally enhanced photo to show how a handrail could have been added to increase safety. Copyright © 2014	by the author.